Super Bowl Food Ideas and Party Recipes – Bon Appetit. As we deal with a snowstorm here in my area of New York and then a family party later today, you can have a chance to look over some more great Super Bowl snack, appetizers and recipes for your party, to bring to a party or just to have for your own while you watch the game. Bon Appetit has all kinds of great ideas for your Super Bowl party guide for all of your favorite game-time snacks. Check it out! Regular followers of the blog already know how much I love sandwiches. I think could be happy having a sandwich for dinner just about every day of the week, as long as it was something different all of the time. I have looked at making Banh Mi sandwiches for a while but I have always kind of shied away from mom because I was worried that Sean and Michelle would not really care for them because of the spice that is in most of the recipes. 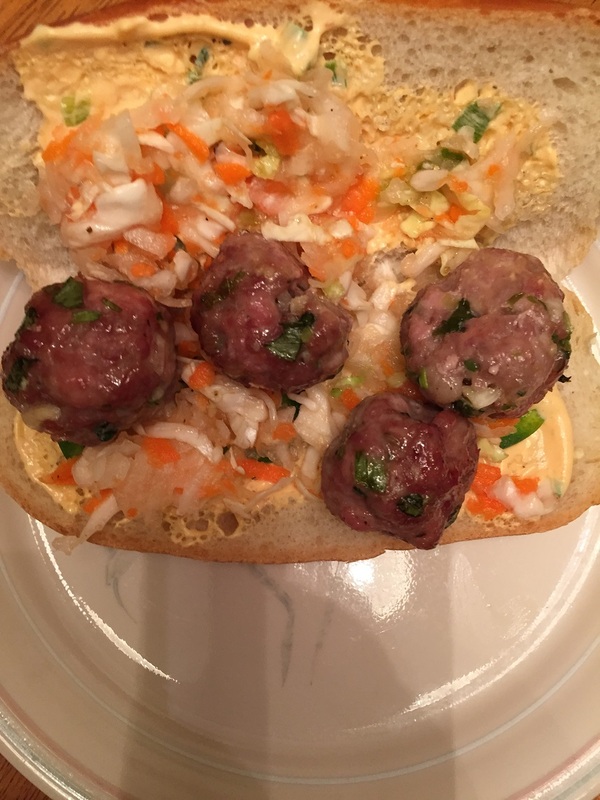 However, when I saw this particular recipe for a pork meatball bánh mì from Bon Appétit, I decided to bite the bullet and give the recipe a try. This particular recipe does use a lot of ingredients that I do not normally have on hand so I did have to get a few things, such as daikon, a Japanese white radish. You may have to go out and get a couple of different ingredients if you want to make this particular version, but it is certainly worth the results. To make the hot chili mayo, stir the mayonnaise, chopped green onions, and hot chili sauce together in a small bowl. Season the mix with salt to taste. The hot chili mayo can be made 1 day ahead and kept covered and chill in the refrigerator. To make the meatballs, line a rimmed baking sheet with plastic wrap. Gently mix the ground pork, basil, garlic, green onions, fish sauce, hot chili sauce, sugar, cornstarch, black pepper and kosher salt in a large bowl. 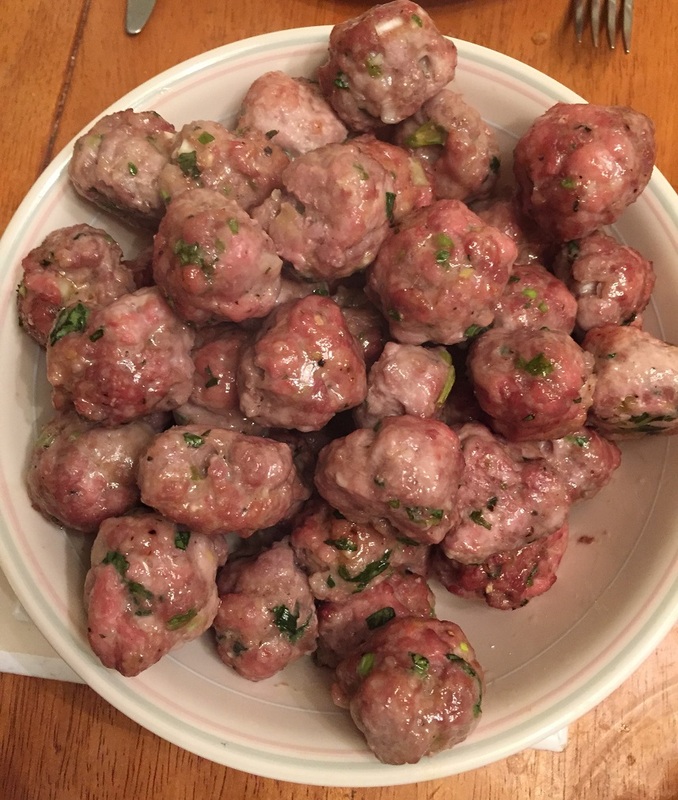 Using moistened hands and a scant tablespoonful for each, roll the meat mixture into 1-inch meatballs. Arrange the meatballs on a baking sheet. Cover and chill the meatballs until you are ready to bake. To create the ingredients for the sandwiches, toss the grated carrots, daikon, rice vinegar, sugar and salt in a medium bowl. Allow the mixture to stand at room temperature for one hour, tossing occasionally. Preheat the oven to 300°. Heat the sesame oil in a large skillet set over medium-high heat. Add half of the meatballs. Sauté the meatballs until they are browned and cooked through, turning the meatballs often and lowering the heat if they are browning too quickly, about 15 minutes. Transfer the meatballs to another rimmed baking sheet and place them in the oven. Repeat the process with the remaining meatballs. Cut each baguette or baguette piece horizontally in half. Pull out enough bread from each bread half to leave a 1/2-inch-thick shell. Spread some of the hot chili mayo over each bread shell. Arrange the jalapenos, then cilantro, in the bottom halves of the bread shells. Fill each sandwich with 1/4 of the meatballs. Drain the pickled vegetables and place them atop the meatballs. Press on the baguette tops and serve. The combination of the spicy mayonnaise, the pickled vegetables and the pork meatballs really make this an outstanding sandwich. Sean had the meatballs without the spicy mayo and he really like the flavor of them, comparing it to a nice piece of sausage on a baguette. I really love the way the mayo combined with the meatballs to give a nice spicy flavor and the pickled vegetables just topped it all off for me. The pickled vegetables are a lot like a coleslaw recipe, so you could use coleslaw instead if you prefer that, but using the daikon gives a little bit of heat to the vegetables. I even used the leftover mayonnaise on other sandwiches throughout the week because I like the way it turned out. I think it would be great on a hamburger, which I did not get to try but I think I will next time. Anyway, this was a fairly simple bánh mì to make that had some nice spice to it and some really great flavor. Super Bowl Appetizers and Snacks : Football Recipes : Cooking Channel. the big game is coming up soon and you want to get ready for your party or game day with lots of great snacks, finger foods and appetizers for the game. Cooking Channel has put together 34 great appetizer recipes that you can use for anyone and everyone at your game day party. Check it out! One of the areas that I am trying to do the most improving in during 2015 comes to the pictures that I take for this blog. Very often I just take pictures right after I have finished preparing the meal so that I can have a picture to display, and the pictures do not always turn out to be the best that I can use but I go with it and that is what I have. I admit I am no professional photographer and I do not spend a lot of time working on the photography for the blog, but I would like to try to get a little bit better at it and take some nicer pictures to use. I would also like to be able to remember to take pictures more often. Very often I forget to take pictures of the side dishes that I have made and only remember it after we have already started eating, not leaving me with anything to take pictures of to put up.. This has kept me from putting a lot of recipes on the blog since I do not have pictures of the recipes I want to use. Today I decided I am going to use a couple of the recipes anyway so at least I can share them with you and let you know how they turned out for me even if I do not have pictures to show you. In particular here are 2 side dishes I tried recently, one from Williams-Sonoma and the other from Bobby Flay. They are for maple-glazed root vegetables and for mashed potatoes with buttermilk, black pepper and green onion. 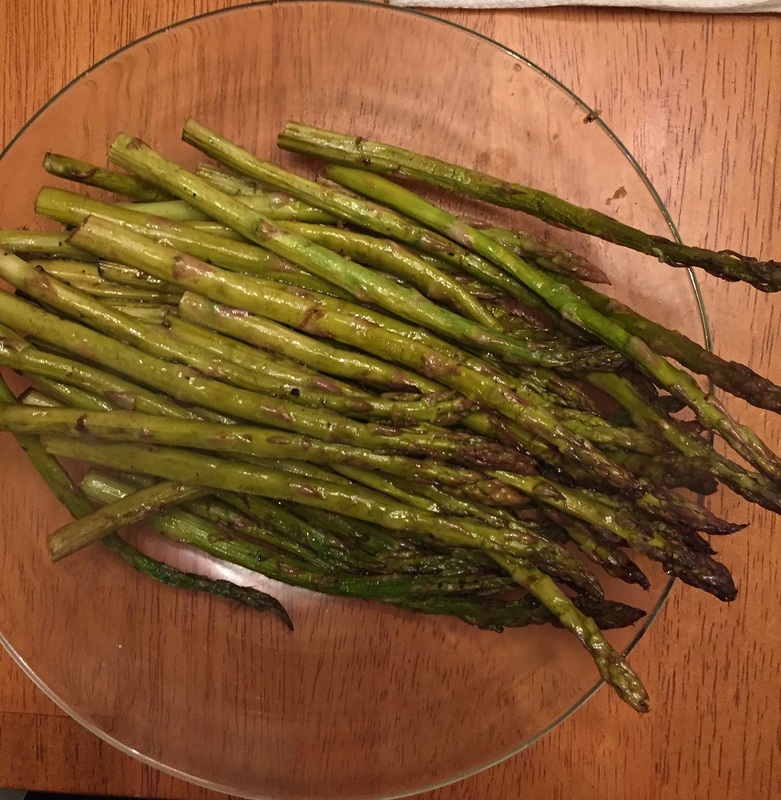 Both are really simple to make and make great side dishes for all kinds of meals. In a large sauté pan set over medium-high heat, melt the butter. When the foaming subsides, add 1/3 each of the turnips, carrots and parsnips. Cook, without stirring, until the vegetables are browned on one side, about 3 to 4 minutes. Transfer the vegetables to a bowl. Repeat the process to brown the remaining vegetables in 2 more batches. Return all of the vegetables to the pan. Stir in the chicken broth, time and 2 tablespoons of the maple syrup, and season with salt and pepper. Cover and cook until the vegetables are just tender, about 7 to 8 minutes. He uncover the pan and continue to cook the vegetables, stirring them occasionally, until most of liquid has evaporated and the vegetables are glazed, about 2 minutes. Remove the pan from the heat. Stir in the lemon juice and the remaining 1 tablespoon of maple syrup and serve. You can pretty much try this recipe with any root vegetables that you like, or just one single type of vegetable that you may happen to have on hand and it works pretty well. While this recipe is for a larger group of about 8 to 10, you could scale it down to fit your particular family size needs. 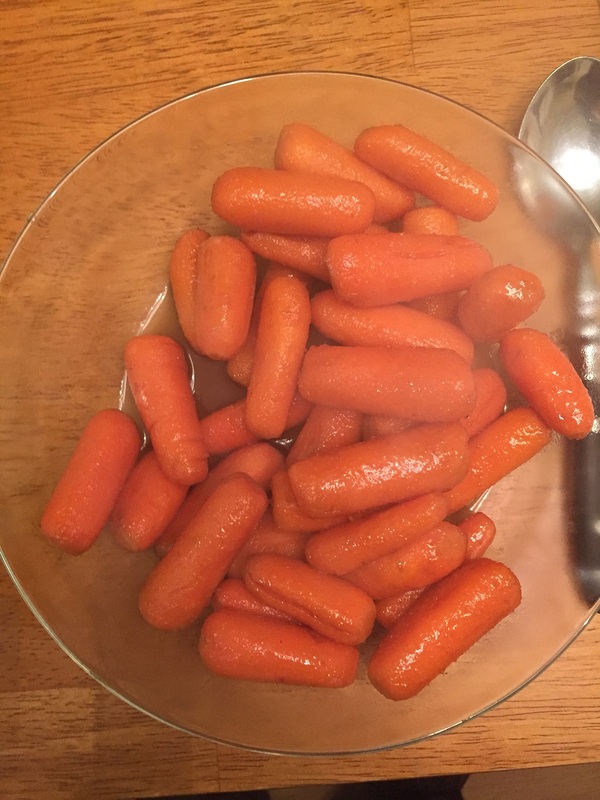 I actually just made this again recently using just some baby carrots that I had on hand and it turned out perfectly, with the carrots having a really nice glaze on it thanks to the maple syrup. It is a great dish to remember to use for holidays or weekend meals and goes really well with beef, chicken, turkey, or pork. The mashed potato recipe is just as easy and just as versatile. Place the potatoes in a large pot and cover them with cold water by 2 inches. Add 2 tablespoons of salt, bring to a boil, and cook until the potatoes are fork tender, about 20 to 25 minutes. Drain the potatoes well. While the potatoes are cooking, combine the butter and buttermilk in a small sauce pan set over medium heat and bring it to a simmer. Working in batches, pass the cooked potatoes through a food mill or a ricer (or just use a potato masher) over a pot. Stir the hot buttermilk mixture into the potatoes until they are smooth and creamy. Season the potatoes generously with pepper and add more salt as needed. Stir in the green onions. Cover and keep the potatoes warm over a simmering pot of water until you are ready to serve. While everyone makes mashed potatoes pretty regularly, this is just a slight variation that gives you a little bit different flavor thanks to the buttermilk, pepper and green onion. I really like a lot of pepper in my potatoes so this was the perfect recipe since the pepper really shines through and the buttermilk really helps to make the potatoes extra creamy and add a little bit of tang to the flavor. Again this is a great dish that you can use for a holiday meal or a nice Sunday meal but it is also simple enough for you can make it during the week to have as a side dish for just about anything, including beef, chicken, turkey or pork. While using a ricer or food mill does produce great mashed potatoes and I do have a ricer to use, I very often find myself just using the potato masher to make them and they come out just fine. The ricer can be a little tedious to use when you have a lot of potatoes and some people like the mashed potatoes a little chunkier with the potato masher anyway.